PHOENIX – The Marine Corps’ website refers to the bayonet as a Marine’s multipurpose fighting knife and the weapon of choice when shots can’t be fired. Since 2012, several law enforcement agencies in Arizona have acquired 447 bayonets in all through a federal program that distributes surplus military equipment. A review of state-level data for the Department of Defense Excess Property Program shows the Pinal County Sheriff’s Office receiving 257 bayonets and police departments in Tucson, Pinetop-Lakeside and Payson receiving 150, 30 and 10, respectively. While bayonets are traditionally attached to guns and used for close combat or for their deterrent effect, spokesmen for two of the agencies said that bayonets there aren’t being used for their intended purpose. “It’s not in our policy to use bayonets against another human being,” said David Sargent, field operations commander for the Pinetop-Lakeside Police Department. Officers in Pinetop-Lakeside, with just over 4,000 permanent residents, used the knives for digging while providing security during the Wallow Fire of 2011 and found them so useful that officials requested more through the 1033 program, Sargent said. “And if you use a hammer on the backside of a bayonet they actually become a pretty good digging implement,” he said. SWAT and Special Response Team officers received bayonets but have them in their gear bags only as small pry bars for doors, Sargent said. “We only use them for special purposes, special needs,” he said. Don Engler, chief of the Payson Police Department, stressed that his officers don’t use the bayonets with rifles. “They’re used as a strong knife for Special Response Teams, but they aren’t attached to guns,” he said. A spokesman said the Tucson Police Department uses its 150 bayonets for a variety of tasks, including cutting wire. He refused to comment further, including addressing whether they are used on guns, before hanging up. “PCSO has a largely rural response and the tools necessary to provide public safety, even if improvised, should not be compared to an urban response and atmosphere,” the email said. NPR has reported that police agencies around the country have acquired about 12,000 bayonets under the 1033 program since 2006. In Pinetop-Lakeside, Sargent said that an advantage to using the bayonets received through the 1033 program is that it saves taxpayers from having to spend money on more specialized tools. “I think the citizenry would rather we use items we got for free than spending taxpayer money on other types of knives,” he said. 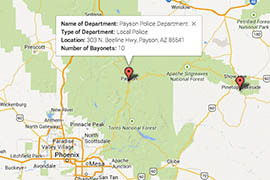 Explore bayonets received by four Arizona police agencies under a military surplus program.